Competition for IT workers in Vietnam is hotter than ever. A new survey of 500 skilled IT workers in Vietnam from ITviec shows that 50% of IT workers will consider changing jobs in the next 6 months. Training and career growth: provide training and opportunities for advancement. Overseas training is particularly prized. Product focus: provide opportunities to work long-term on products and different aspects products (for example, front-end, back-end, database, etc.). This can be done an an outsourcing environment by rotating developers to different skill areas. Download all survey data, infographic files and photographs of IT working environments here. With many choices of companies and attractive salary, keeping employee is a challenge for many companies. 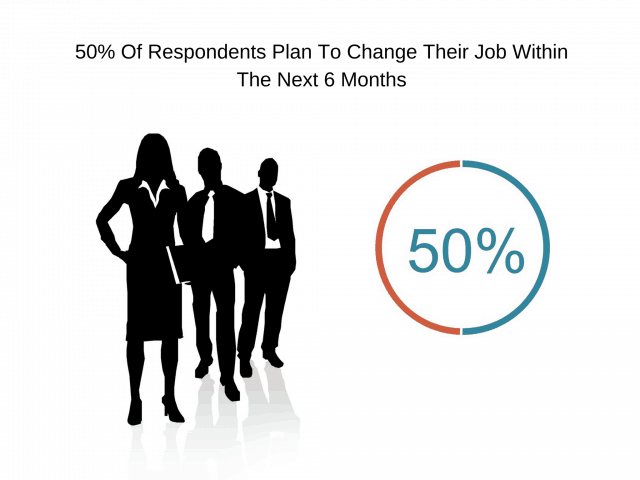 50% of respondents plan to change their jobs within the next 6 months. Training opportunities and feeling that management cared for them are the biggest factors that separate workers who plan to leave in the next 6 months from workers who plan to stay another year or more. “Nearly all our customers tell us they will grow in 2015. They will hire 10%, 25% or sometimes 50% more workers,” said Chris Harvey, CEO of ITviec.com, Vietnam’s leading online recruiter for IT positions. 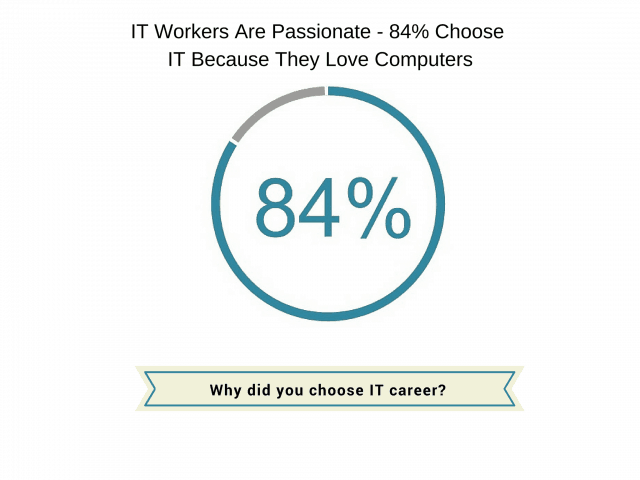 84% of survey respondents said they chose a career in IT because they “love computers.” This reason was more important than salary or stability. 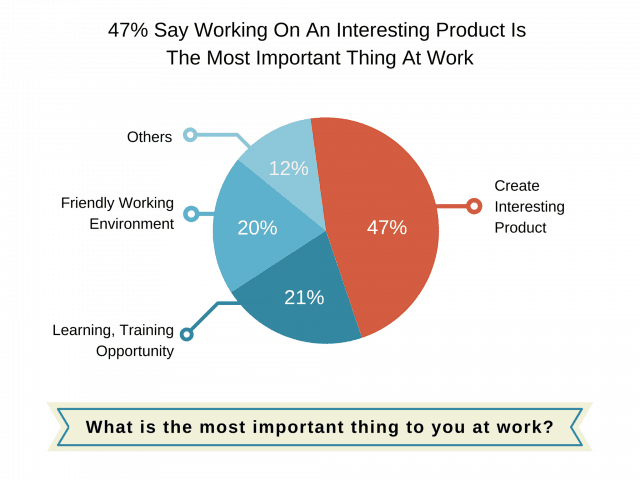 47% said that “working on an interesting product” is the most important consideration in choosing a job. 46% of respondents prefer to work at a product company whereas only 10% prefer to work at an outsourcing company. 44% have no preference between outsourcing or product. 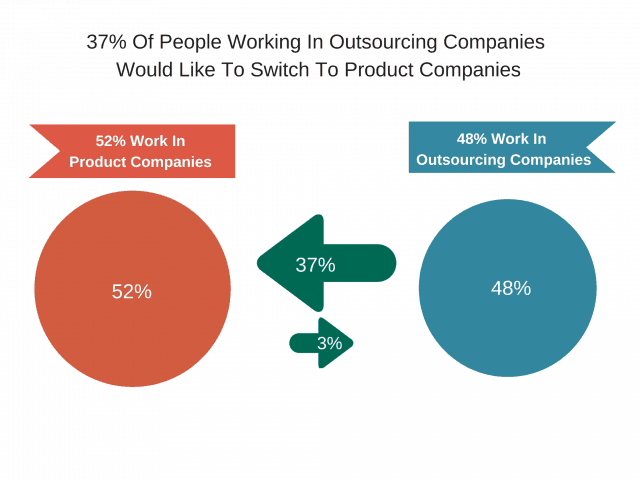 While the number of IT people working at product companies vs. outsourcing companies is roughly equal at 52% and 48%, 37% of people working in outsourcing companies would like to switch to a product company. 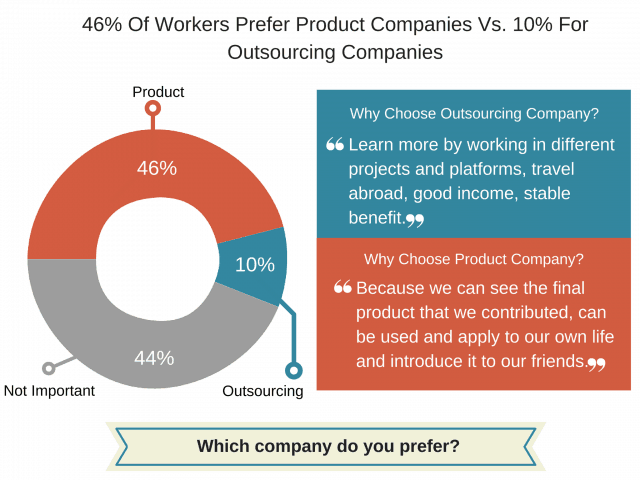 Only 3% of people working at product companies want to switch to an outsourcing company. Although, outsourcing companies are growing fast and sustainable, the work is often project based and workers switch often from project to project. Product companies allow IT workers to work on a product long-term and feel more ownership. Interestingly, Hanoi IT workers are more less interested in product jobs than their Ho Chi Minh cousins. 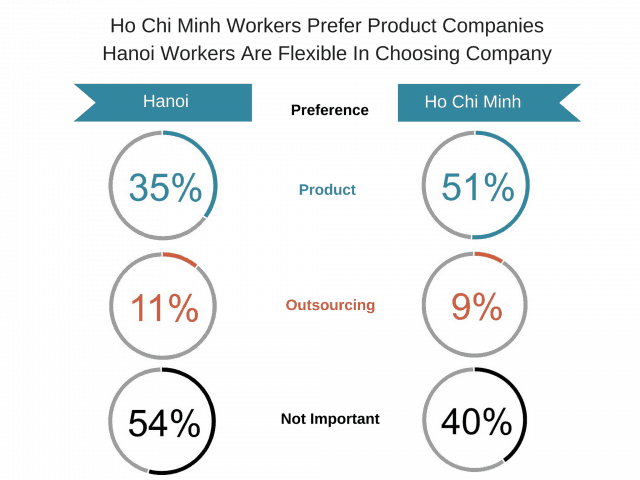 65% of Hanoi workers don’t have a preference or prefer outsourcing versus 49% for Ho Chi Minh. 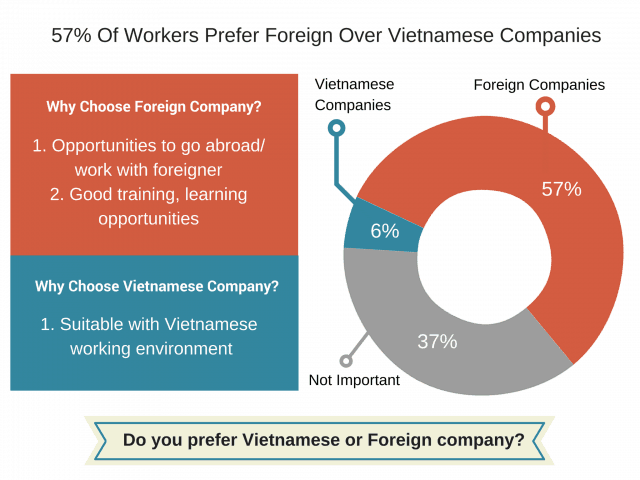 57% of respondents prefer to work at a foreign-owned company, whereas only 6% prefer to work at a Vietnamese company. 37% have no preference. 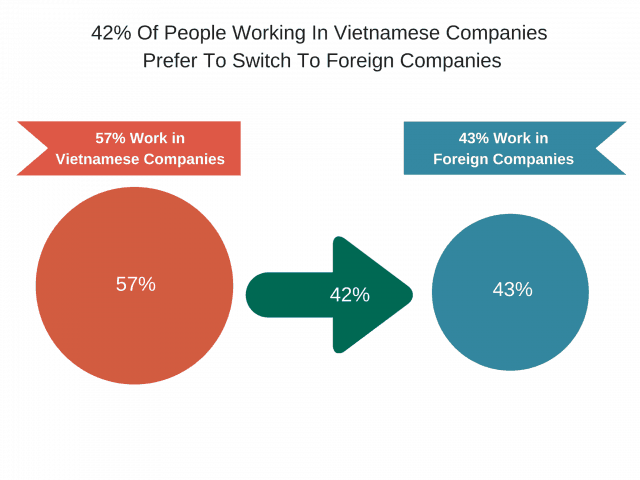 42% of people working in Vietnamese companies want to move to foreign companies, and no one working in foreign companies wants to move to Vietnamese companies. 65% of Ho Chi Minh workers prefer foreign companies compared to only 36% of Ha Noi workers. 35% of Ho Chi Minh workers either don’t have a preference or prefer Vietnamese companies compared to 62% for Ha Noi workers. 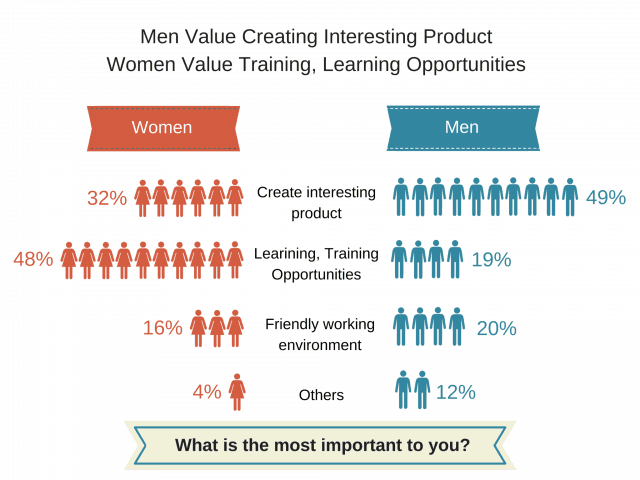 49% of men said creating interesting product is most important consideration in choosing a job compared to 32% of women who said the same. 48% of women listed training as most important vs. only 19% of men.